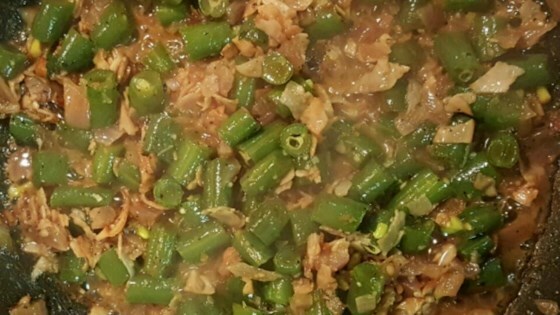 "Homestyle green beans like grandma used to make. Right out of a can, fool anyone even grandma." Heat a saucepan over medium heat, and add the bacon pieces. Fry for a few minutes, then add the onions. Cook and stir until the onions are tender, about 5 minutes. Pour in the green beans, and crumble in the bouillon cube. Stir to blend, then simmer for about 15 minutes. If you wish to simmer longer, add more water to keep the beans from scorching. Slow-cooked green beans with bacon—it's Southern-style comfort food at its best. I substituted chopped ham for the bacon. I let the ham, and onions simmer a while in the liquid from the beans with the bouillion. When the onions were cooked then I added the green beans. Always rinse your cans of green beans! It takes out the can-y taste. These were very quick and easy to make and tasted great! I used fresh beans instead of canned. These are good. I doctor these up with a touch of bacon fat, salt, pepper and garlic and/or garlic powder. Let simmer a good while for best taste. Good but still tasted like green beans out of a can. I like the cooking style so I'll still give it 5 stars because this will be good with thawed frozen green beans or fresh ones. Thanks.